What exactly took place in the Oireachtas Committee on Funding Domestic Water that ended in highly controversial circumstances in April this year. There are many questions that members of the committee and politicians have failed to answer and that the mainstream media have not bothered to ask. 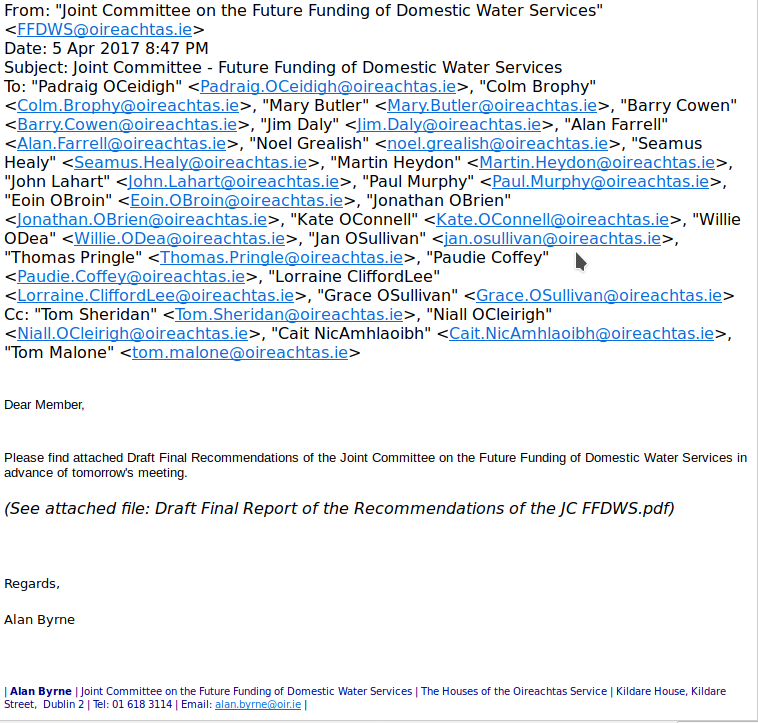 Twenty members of the Joint Oireachtas Committee on Future Funding of Domestic Water Services. Top two rows were professed anti water charges, anti metering and anti Irish Water delegates. The short answer is: there are many many unanswered questions and we don’t know exactly what took place. It's like a wall of silence has been erected and any mention of paragraph 9.4 or what went on in the many Private Session is taboo. For example, we don’t know what influence Minister Simon Coveney or the Eu Commisioner Vella’s threats had on the process. We don’t know whether Fianna Fáil reneged on promises, whether to Fine Gael or to the anti water charges members. We don’t know why the Right2Water committee members appeared on the Dáil plinth on April 6th and prematurely hailed the draft report a victory. We don't know whether the Right2Water bartered away some key demands. And the biggest conundrum of all is we are unclear whether the committee members, especially those professed anti water charges, anti metering and anti Irish Water Ltd members, agreed with the 'Confidential Draft Report' of April 5th, even though there was no mention of Paragraph 9.4 of the Water Framework Directive 2000/60/EC and most importantly no mention of invoking this paragraph in Ireland’s second River Basin Management Plan. Even after emailing the chairman Pádraig Ó Céidigh, querying committee members and last but not least our numerous requests from Right2Water Ireland, we still are unclear how exactly the ‘Draft Report’ came about or whether it’s contents were agreed by the members of the committee. However, we do know that there were many claims and counter claims after April 5th, with Fine Gael accusing Fianna Fáil of going back on promises and Sinn Féin accusing Fianna Fáil of multiple turnarounds and Fianna Fáil denying any of it. After a phone conversation with the committee secretary Tom Sheridan who told us that the contents were agreed by the members and that is how the process works, we are gravitating towards some kind of committee member's agreement with the contents of the controversial draft report. However, the only confirmed fact at the moment is not one member of the committee objected to the omission of 9.4 in the draft or final reports. Surely it is our right to know what this committee and it’s members got up to and not rely on hearsay or misinformation. Basic information like 'what exactly did they agree or barter away during all those private sessions, especially the last ten private ones from February to April, should be readily available? It is not and no one wants to talk about it. As mentioned in our earlier article we have a big problem with this committee’s protocol and the numerous private sessions. Who drafted the contents of the ‘confidential draft report’ and why was the most important issue, that of Ireland’s ‘Established Practice’ enshrined in the EU Water Framework Directive, paragraph 9.4 , not included? Did the committee’s officials decide not to include it? Or did the members themselves agree the contents of the draft report including the omission of any mention of paragraph 9.4. In other words, in both scenarios, was it a deliberate omission? After all that went on during a full day’s debate on February 15th and the importance Chairman Ó Céidigh gave to the debate, it should have been included. Because of the importance of the 9.4 paragraph to Ireland any member of the committee who supported anti water charges and anti metering should have been up in arms over the omission. There wasn't even a whimper. A recent email that came our way, (see below) written by Alan Brynes and addressed to all committee members and the secretariat, including the chairman Pádraig Ó Céidigh, confirms the existence of this ‘confidential draft report’. We say this because even some in Right2Water are denying it's existence. In a phone conversation with a committee secretary we were told that the contents of this report were agreed by the committee members. If this was the case, then it follows that the members of the committee agreed not to include paragraph 9.4 or any mention of the River Basin Management Plans or any mention of February 15th debate. What corroborates this conclusion is the total lack of criticism about the omission from any member of the committee and their absolute silence afterwards. This is the paragraph in the The EU Water Framework Directive (2000/60/EC that enshrines Ireland’s ‘Established Practice’ into European law. It was transposed into Irish law by the European Communities (Water Policy) Regulations 2003 (S.I. No. 722 of 2003). Paragraph 9.4 was negotiated by Fianna Fáil , the government of the day in 2000, who were forced into it by past successful anti water charges’ campaigns. Hence it was called the ‘Irish Exemption. The paragraph is undoubtedly Ireland’s best defense against the EU Commission forcing water charges and metering through, in any shape or form. It must be invoked in the second River Basin Management Plan which will be sent to Brussels on the last day of this year. Another little bit of information is that the Irish Government is not obliged by EU law to bring in water charges and paragraph 9.4 of the Water Framework Directive 2000/60/EC establishes this. However, we believe that this paragraph and any form of water charges are mutually exclusive.